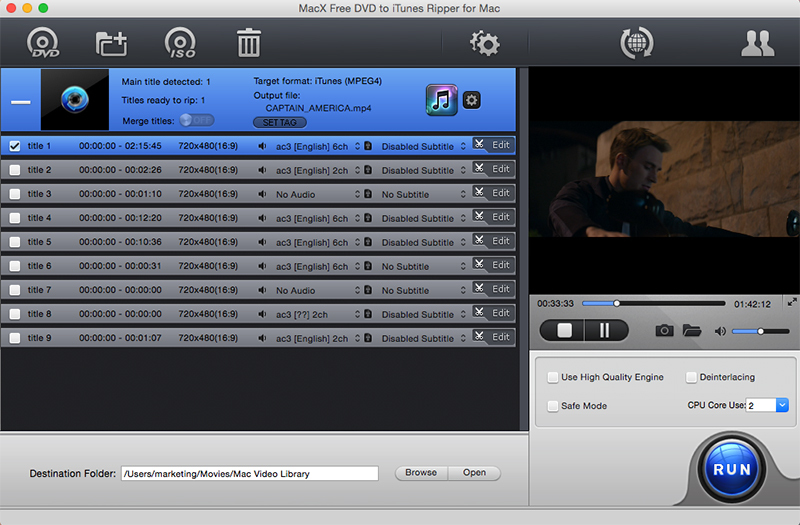 MacX free DVD to iTunes Ripper for Mac is a totally free application to rip any DVDs to iTunes supported video audio formats like MP4, MOV, MP3 and simplify entertainment on iTunes. Moreover, this free Mac DVD to iTunes ripper can also remove and bypass various DVD copy protections like Sony ARccOS, region protection, CSS encryption etc. It also works as video editor to assist you in trimming, cropping, merging, adding subtitles etc. - Convert and rip DVD to iTunes compatible video & audio formats for Mac users, so that you can transfer DVD movies into iTunes library for iPod/iPhone/iPad/Apple TV. - It supports ripping all kinds of DVDs, including the DVDs protected by Sony ARccOS, region protection, CSS encryption techniques. - This free DVD to iTunes ripper helps Mac users to convert DVD to MP4 & MOV Quicktime files for playing DVDs on other media players. - This free Mac iTunes ripper can extract audio from DVD as ringtone, take snapshot that you favor. - Equipped with high quality engine and hyper threading technology, it even supports multi-core CPU to get a remarkable ripping speed and superb output video quality. - This free iTunes DVD ripper also offers flexible parameter settings to you to flexibly customize the converted videos, such as frame rate, video resolution, video bitrates, audio volume etc. - Download this free and clean Mac DVD to iTunes ripper to manage converted videos with basic editing features such as trimming, cropping, resizing, merging, adding subtitles. - Very user-friendly interface and Quality Profiles realize 1-click to be professional .